While it’s true, generally, that triathlon is not a “zero-sum game,” it’s also not entirely true, at least in certain circumstances. In other words, the math in this situation is usually applied along the lines of why you shouldn’t ride too hard (or even, rarely, swim too hard), because you will always “pay” double or triple or more for the times you go over the red line later on in the race. But one area where triathlon seems to trend more towards zero-sum is when you perform at a subpar level despite your best intentions to the contrary in a single discipline. I’m talking about those times when you’d like to do better, but just can’t. I.e., you have a bad swim and felt like you couldn’t swim any faster no matter how hard you tried. Or you have a bad bike where you just can’t push the pedals. In these cases, it seems more often that things tend to balance out, if you have some faith that they will. This is not true if you’ve tended to overdo it and are now trying a more conservative approach; in that case, you can generally expect a greater than zero “ROI” on your pacing strategy. If you are the guy who always, “had a great bike, and then just fell apart on the run,” then your problem is that you fail to recognize that triathlon is not, in that case, a zero sum game; you need to pace better – slow down. But one of the things that is nice about triathlon is that you often have a chance, at least in long course racing, to “avenge” an earlier mishap of underperformance (as opposed to overperformance, where you will suffer the consequences). Likewise, today (or maybe yesterday by the time I finish writing this), I found myself with subpar legs on the bike at Calgary 70.3. I had a “representative” swim – I swam as well as I should have and felt in control and came out of the water where I should have *right now. * I still expect to improve my swimming, but having the swim I should have was a nice change from Portland and even Wildflower. Out on the bike, my legs felt quite good for the first 20 minutes or so. Even the first 30 minutes were “okay,” thought not stellar, and I think the terrain may have masked how quickly things started to degrade. But then things became obviously not good. No course topography or anything else to hide behind. I say, “not good,” because things weren’t clearly yet bad. I spent the first 20ish minutes making forward progress. Then, for about an hour, I stopped making any forward progress, but I also didn’t go backwards, referencing the two guys I could see up the road in 2nd and 3rd. Then, in the last 45min of the ride, when I am normally at my best, eating up huge chunks with my typically steady pacing, my riding descended into the realm of “bad.” With Ironman Canada as my big focus, and Calgary 70.3 a somewhat last minute addition to the schedule, Coach Krueger had put in some additional focus to keep my biking where it needed to be, but with some unexpectedly hot weather showing up in Penticton (summer! finally! ), I think it took more out of me than it might have otherwise. Very often, your strengths can also be your weaknesses. I saw this before Wildflower, where my biking ability put me in a deep hole in training, the sort of hole I probably could not dig for myself swimming, for example, simply because I don’t have the fitness to do so. Something else would give out long before my overall physiology in the pool. But on the bike, I can go into the well – deep in to the well – and that’s not always a good thing. With the heat, it wasn’t about smashing a ride; it was that, despite getting hot, my performance in training didn’t seem to suffer. But you always have to pay for that somewhere. And I paid for it on the bike in Calgary. I also didn’t do a long taper for the race, since again, the focus is on Ironman Canada. Coming off the bike in fourth, and then finding out that I had indeed lost time in the late stages of the ride (hope always springs eternal that everyone else might also be suffering), I decided I was going to try for a personal best on the run. I was reminded of Abu Dhabi, and I thought, “I can still run.” Note to self – the Calgary run course is NOT conducive to PBs. That plan seemed pretty good for about two miles. And then I started to fade. And then I started to fade badly. At that point, it was largely about me and proving to myself what I was capable of more than any result or placing. I knew that I wasn’t likely to win the race. Tim O’Donell is a veteran racer with a long and steady palmares; baring a total meltdown, which can always happen, if he ran an “average”run split, he’d take the win comfortably. But I thought a great run might get me back on the podium and would, at the very least, validate all that hard running as paying off on race day. And that was the way I started out. But after those first couple of miles, it seemed as if it wasn’t just bad legs, it was just bad body – the fatigue was deeper than I thought. But I wasn’t about to roll over voluntarily. I was going to do my best to make guys work to catch me; with the race paying on five-deep, I at least wanted to pay for my “training day” on the race course. And, of course, I don’t like getting beaten by anyone, so it’s less distasteful to get beaten by three people than by four. But really, I wasn’t super optimistic about how things were going to turn out. And with the Calgary run course being a difficult one, I thought that the big hill I had run down on the way out was going to hurt in a big way on the way home. Coming around the turnaround at 10.55km, I was down about 2min to 2nd, Brian Fleischmann who is a veteran short-cours racer from the USA, and 1min to 3rd, Graham O’Grady who won Portland Rev3. I was also less than a minute up on 5th, Trevor Wurtele who has made amazing strides this year working with Paulo Sousa and his Triathlon Squad. Paulo and I are good friends, and I knew that Paulo would want me to make Trevor work for it (ha! ), and so on the way back in from the turnaround goal number one keep the pressure on. Some of the early stretches on the way back were conducive to building some turnover and pace, and then, suddenly, it seemed as if that turnover and pace was sticking. And then, even more suddenly, I saw the faint outline of Graham O’Grady up the road (or path, as we actually had a really nice path in Glenmore Park to run on). In Portland, I felt like I was too patient, and that I should have taken a risk earlier to try and reel Graham in. I was running well there, and I should have seen just how well. So, with not much to lose, and my general aversion to making the same mistake twice, I thought I’d drop the hammer with 6km+ to go, and just see how long I could hold it. So I kicked up the pace again, dropping it from my “surge so as to not get caught” pace, which had barely brought me back to “normal” half-ironman pace, to full gas. And I thought I’d just hold it there until I caught Graham or until I blew. Graham kept getting closer, and I didn’t see Trevor getting any closer as I made some 90deg turns and could look back with looking backwards (big race no-no), and I didn’t seem to be blowing up. And then, with about 2km to go, I was pretty sure I could catch Graham. And then, as I passed Graham, I saw Brian Fleischmann just up the road, and I recalled Coach Joel’s famous (in my mind) words to me at the end of a 5km road race, “it would be pretty BAMF if you caught that guy.” So I decided to catch Brian too. And then I did. After digging in that hard, I wasn’t going to get re-passed, so I kept the pace hot until I was in the chute and had the finish banner in my hands. I guess it’s fitting that in the home of the Calgary Stampede, my race was decided by my run. I’d like to offer special thanks to Joey’s Eau Claire. (Joey’s is a Canadian restaurant chain that’d be like a 3.5-star version of TGIFridays, which I consider a 2-star restaurant; it serves “bistro fare.” I cannot think of a US equivalent, though Canada has several, including Earl’s, Brown’s, and Milestone’s.) It was right across the street from my hotel. I know and trust the food there. And so I had four of the six meals I ate in Calgary there, every meal except breakfast on Saturday, when I had an omelette at the hotel restaurant, and race morning, when I had my typical pre-race breakfast. Thanks also to Chef Mark, who introduced me to the Caesar, which is a Joey’s special. It’s a blueberry “Mojito.” I quite like Mojitos, though I basically only ever drink virgin ones, which I think are pretty much the perfect summer drink, and the Caesar is an elegant alternative. I had one the night before the race, and I’m going to defer to that as the source of my second half kick. Other than that, my nutrition plan for the race itself was identical to Portland, which seemed appropriate given roughly equivalent weather conditions in Calgary; you can find a copy of my standard in-race consumption on the FirstEndurance website. 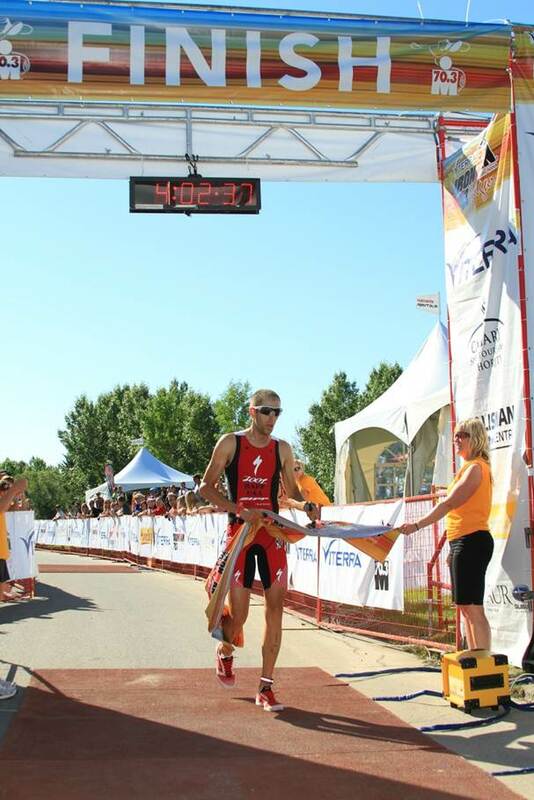 As a last aside, the winner of the Ironman 70.3 Calgary receives an authentic Reebok replica Calgary Flames jersey. Previously, they had given jerseys signed by the team, but this year, they had jerseys that bore the “name,” “Calgary 70.3,” and the number 1 on the back; it’s pretty much the coolest trophy I’ve ever seen at a race. All finishers get a giant belt buckle finisher medal (that actually is a belt buckle), which is also pretty cool. But I want that jersey. So I’ll be back. It’s also a pretty spectacular venue, and I’d like to see what I could do on the bike course with proper legs. So (cowboy) hats off to the race. See you next year. That effort was BAMF. A mental win. The race report was as entertaining as any mystery novel. While reading it, I was trying to figure out how your race could even theoretically end with that photo. (Did I imagine you breaking the winner's tape) To reel in other fast pros at the end of the run is special. I've always thought a tri was won on the bike, but you've shown there is another way. Caesars are made with Clammato (Clam/Tomato) juice. That's a traditional Caesar; this is strictly a Joey's creation. It's definitely NOT something made with Clammato!